Large Imprint Area These Fans Are Great For Sporting Events. Approximate Size: 6 3/4" Diameter. Imprint Area: 4" W x 3" H Packaging: 250 per carton @ 16 lbs. 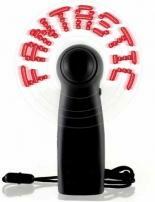 This item is not a toy and should not be used by children, Soft safety blades, Light goes on when fan is on, Neck cord included, 2 "AA" batteries included (not inserted). Size : W 4 1/4" x H 1 1/8"
An air freshener that can be hung from a car rear view mirror; may also be clipped to an auto air vent at the discretion of the user, Delightfully fresh scents, with several optionsm, Odor eliminating technology helps neutralize odors while the air freshener releases a refreshingly pleasant scent, Fun shape; has been known to resemble a water or blood droplet for a specific marketing needm, Individually packaged in a cellophane bag with an instructional insert card. Dimensions : 1 3/4" X 2 1/4"
This item is not a toy and should not be used by children, Soft safety blades, Latching cover, Stands on any surface, Powerful long-lasting motor, 2 "AA" batteries included (not inserted). Size : W 1 1/4" x H 1 1/2"
Foam blades White standard bulb light Break-away lanyard Rubber base pads AA batteries included (not inserted). Decorating Dimensions: 3/4"W x 1-5/8"H Shipping Information: Packed: 100 Per Box Actual Weight: 16 lbs. Dim Weight: 16 lbs. Box Size: 22 x 18 x 6. 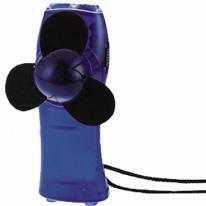 Mini Fan includes AA Batteries not Inserted Black Accents Individually Poly bagged. Size: 4 1/8"W x 1 7/8"H x 1 7/8"D. Max Imprint Area: 1 3/4"W x 1 1/4"H. WT_100: 29 LBS. Paper-Proof: $10. (Required on all labels). 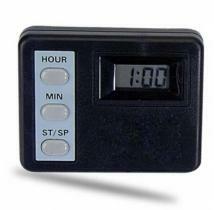 Count-up/ Count-Down Timer Count-up to 19Hrs 59 Min Count-down from 19Hrs to 59Min. Desk-top stand and Magnet back. Product Dimensions: 2"H x 2-1/2"W x 5/8"D Imprint Dimensions: 3/4"H x 1-1/4"W Extra color/position imprint add $55.00 set up, plus running charge of $0.80 per piece for quantities of first two pricing columns, $0.40 per piece for quantities of last two pricing columns. Gift box and battery included. Units/Weight Per Carton: 200 pcs/18 lbs. A multi-function jump rope that counts rotations and calories burned on the digital screen. Comes in a vinyl bag. Adjustable rope included. Size: Rope Length: 9' 11" Imprint Area: 1 1/4"w x 3/8"h Optional Imprint Area: 1 9/16"w x 5/8"h Carton Size: 16" height x 21" width x 14" length Carton Weight: 36 lbs/100 pcs. Dome shape mood light. Push bottom button for 7 color changing LED light. Product Size (H x W x D): 2.75 x 2.00 x 2.00 Imprint Area: Front 7/8"h x 7/8"w Packaging: Gift Box Pieces Per Box: 200 Weight Per Piece: 0.11 lbs. Weight Per Box: 22 lbs. Case Dimensions (L x W x H): 12 x 13 x 20. Your custom message in lights Up to 6 lines of 16 characters each Batteries & lanyard included 3 LED color choices Batteries: 3 AAA Size: 1 3/8" x 4 1/4" x 2 1/4" Imprint Size: 7/8" x 1 1/4" Standard Pack: Tuck box Wt/100 pcs: 26 lbs. A magnet that talks back We add your custom 10-second message Keep track of notes, lists, reminders. Batteries always included. Batteries: 3 AG13 button cells Sound: 10-second custom. Size: 2 3/16" dia. x 1 1/4" h. Imprint Size: Base - 1 1/8" x 1/2", Top - 1 1/4" dia. Standard Pack: Tuck box Wt/100 pcs: 14 lbs. 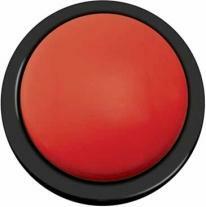 Micro version of our popular Big Sound Button. 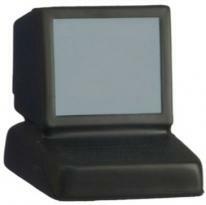 We program your custom 10-second audio message. Push to hear sound. Batteries always included. Specialized equipment required to program the button\'s sounds. Sound: 10-second custom Batteries: Button cell (3 AG13) Size: 2 3/16\" dia. 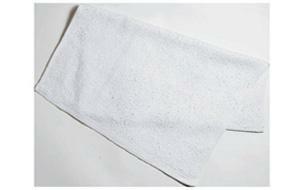 x 1 1/4\" high Imprint Size: 1 1/4\" dia. - Top, 1 1/8\" x 1/2\" - Base Standard Pack: White box Wt/100 pcs: 14 lbs. Metrotone: A sound system for the desk and work area. Contemporary design features a metal front panel. Built into the underside of the unit is a cord that plugs into a iPod or any MP3 player. A second USB cord is included with the unit which can be plugged directly into a computer. An FM Radio is controlled by the dial at the top of the unit. Material: Plastic and Aluminum Product Dimensions: 4-3/16"H x 4-1/8"W x 3-3/4"D Imprint Dimensions: 1/2"H x 2"W Finish/Trim: Powder Green With White Trim Extra color/position imprint add $55.00 set up, plus running charge of $0.80 per piece for quantities of first two pricing columns, $0.40 per piece for quantities of last two pricing columns. Gift box included. Packaging: Beige Tuck-in Gift Box Units/Weight Per Carton: 24 pcs/28 lbs. In the mood for rock, reggae, pop, classical, or country? Well, this FM Scan radio has a mood of its own. Watch it change colors from white to blue, green, orange and pink. 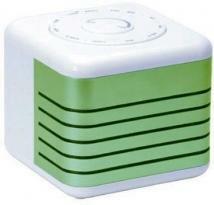 Product Features FM Scan Mood Radio. 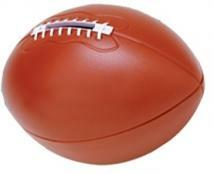 Finish/Material: Plastic Dimensions: 3" W x 3" H x 3 5/8" D Imprint Area: 1 1/2" W x 1 1/2" H Carton Weight: 17lbs / 24pcs. Epic: A masterful blend of sound and time, A AM/FM digital tuning radio with 10 programmable stations, digitally displayed on the screen, The digital clock with alarm and snooze features a backlight that stays lit for 3-5 seconds when pressed, Built into the underside of the unit is an auxillary cord which allows the unit to become a speaker to any MP3 player. 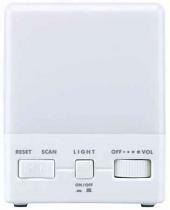 Material: Plastic and Metal Product Dimensions: 2-1/8"H x 7-3/16"W x 4-7/8"D Imprint Dimensions: 1/2"H x 2"W Finish/Trim: White with Silver Extra color/position imprint add $55.00 set up, plus running charge of $0.80 per piece for quantities of first two pricing columns, $0.40 per piece for quantities of last two pricing columns. Gift box and battery included. Packaging: Beige Tuck-in Gift Box Units/Weight Per Carton: 12 pcs/22 lbs.